In today’s Providence Dental blog we will discuss how pregnancy impacts your dental health. Taking care of your mouth and teeth while waiting for your bundle of joy is important your dental health. You’ve already got a lot on your mind, of course. And there are lots of changes going on in your body. Changes in your hormone levels increase your risk of a number of oral health issues, like gum disease. Hormones can lead to a condition called pregnancy gingivitis. The signs of pregnancy gingivitis are much like ordinary gingivitis: you may notice bleeding gums when you brush your teeth. One of the best remedies for this is to get more frequent cleanings from your hygienist, at least for the duration of your pregnancy. Another condition unique to pregnancy are what a known as pregnancy tumors. They sound frightening, but they are not malignant. They usually show up during the second trimester, and look like little raspberries. They usually go away as soon as the baby is born. But if they bother you, we can remove them. Many women experience morning sickness when they are pregnant. This too can bring up an oral health issue. The acids in your stomach can damage your enamel. The best way to counter this is to rinse your mouth out with baking soda and water right after it happens. It’s a common misconception that dental X-rays are not safe when you are pregnant. Not only are they perfectly safe, but medical professionals actually encourage it as a part of your overall health care during pregnancy. There’s a lot going on in your life as you carry new life within you. It’s essential that you take care of your teeth and gums, along with everything else. See us at Providence Dental in Las Vegas for regular checkups and cleanings. 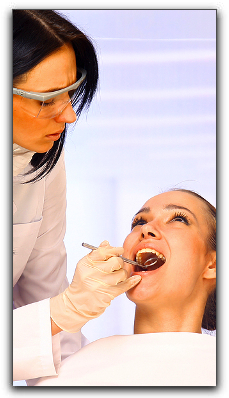 We provide family and cosmetic dentistry, orthodontics, and many other services. Make an appointment with us today.